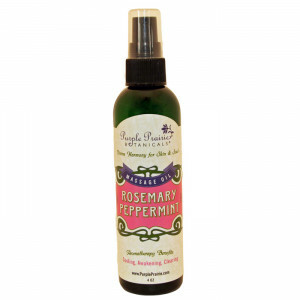 Rosemary and Peppermint wake up the brain, soothe muscle aches and helps cold symptoms. Relieves sore feet and headaches. 4 oz. bottle with pump top. Click here to try a sample. Directions: Use medicinally for colds, sore muscles, for massage and after shower for nourished, soft skin. 100% Natural Ingredients: Organic olea europaea (olive) fruit oil, organic helianthus annuus (sunflower) oil, mentha piperita (peppermint) oil, rosmarinus officinalis (rosemary) oil, tocopherol (vitamin E). 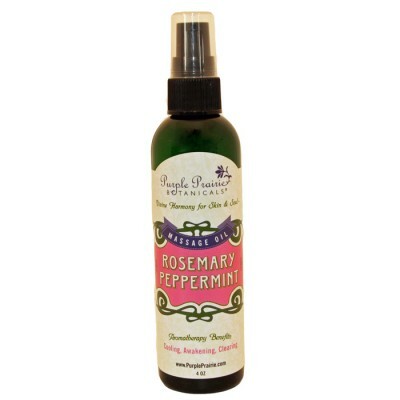 Rosemary Essential Oil-Organic Pure undiluted essential oil of certified organic Rosemary~ a..